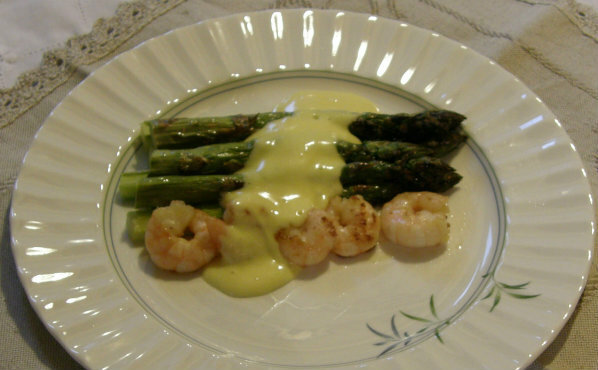 We enjoy asparagus with cheese sauce as a light lunch in spring. While the weather is still getting over winter but as soon as asparagus hits the shelves this makes a warming snack combined with the taste of spring. Once the salad crops get into swing in the garden we switch over to salad but until then this recipe hits the spot. It also makes a great appetizer with prawns. Use your favourite cheese with this recipe to adjust the overall flavour. There are so many fantastic cheeses to try you could be experimenting with different versions of this recipe for years to come! The recipe is very simple and its quite quick to make be sure not to end up with lumpy suace by adding the milk slowly and beating in well over a low heat. Enjoy while hot with crusty bread or rolls.